Attleboro is only returning three starters from last year’s squad but the Bombardiers are hopeful that its incoming players will keep them competitive in the Kelley-Rex this season. Senior captain Harry Lancaster will anchor the back line, showing his versatility by playing yet another position in his fourth year on varsity. Senior captain Ahijah Joseph will see time at both forward as well as some time in the midfield, alongside junior Zach White, another returnee. Junior Nick Hasenfus will take over as the starting goalie while seniors Tyler Treichler and Nick Lawrence will also emerge as key contributors this season. Head coach Peter Pereira also expects to get contributions from underclassmen including sophomore Will Halben and freshmen Mike Russo and Nathan LaPlume. Franklin has some big holes to fill around the field but returning nearly a dozen varsity players is a good start. Around 10 returning players saw valuable varsity minutes last season and that is something the Panthers will rely on. The Panthers have to find replacements for midfielders Austin Kent and Nick Parent, along with defender Dan Geraci and goalie Henri Guilmette. However, Franklin doesn’t need to find any replacements for its strikers with both Farley Asmath and Kevin Hall back this year. Hall was second on the team with seven goals a season ago and Asmath is speedy, strong player that could add a lot to the attack. Hatim Brahimi (five goals, three assists in 2015) is one of the top returning players in the league and will lead the midfield for the Panthers this season. Franklin’s defense will consist of a rotation of five or six players, including Wesley Kozil and Noah Scafati. Senior Joe Kroon and junior Fred Beckmann will battle for the starting goalie spot. “We’ve got a bunch of great athletes that are pretty good soccer players that work really hard,” head coach Fran Bositis said. The Kelley-Rex division title race expects to be a very contested one and King Philip looks like they’ll be right in the mix this season because of a strong balance of returning players. Senior captains Cam Mullins and Ryan Coulter are returning to anchor the back line, which had a strong showing in 2015 with the fourth least goals surrendered in the Hockomock. Both have proved in the past to be reliable defenders, especially in the air against set pieces. Although the Warriors will have to replace the versatile Joe Kellett, KP has a handful of young players that saw valuable minutes on varsity and can make an impact this year. Tyler Mann will lead the attack, a year after scoring a team-high eight goals as a sophomore. Senior Colby Koch has shown his versatility in the past and will also be a factor for KP again this this. Juniors Connor Mullins, Larsen Keys and Mike Rowe also will be key players for the Warriors this season after each of them played meaningful minutes as sophomores. “Our goal is to build off last year’s successes, continue to improve everyday, and compete hard,” head coach Nick Gale said. The defending Kelley-Rex champions will look to try to win back-to-back league titles for the first time in program history and they have a large amount of returning players that could help accomplish that goal. Captain Max Gurnon, a 2015 HockomockSports.com Best XI selection, returns for his senior campaign to anchor an experienced back line that allowed just 15 goals last season. 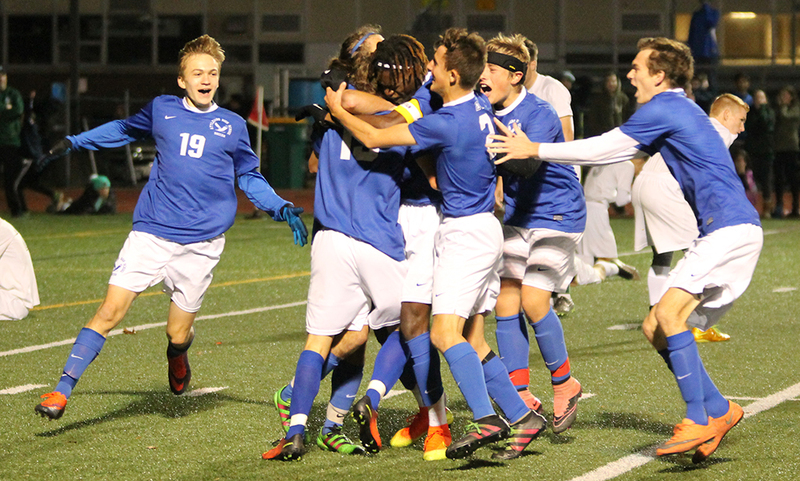 While Mansfield must overcome the graduation of Chris Elsner, juniors Nick Hyland and Harry Braidt both started on the back line last year while sophomore Ethan Brill-Cass looks to be the final piece to the defense. Mansfield will have to find a replacement for goalie Mike Kirejczyk but head coach Steve Sheridan said senior Jed Tolbert and junior Nick Ferraz will battle for the starting spot. The Hornets finished fifth in the league in scoring last year and graduated its top four scorers. However, there is a group of attacking players back that saw plenty of minutes. Senior captain Brendan Sullivan will be a speedy option up top while classmates Kevin Bouck and Ryan Amaral will figure into the offense. Senior captain James Chotkowski will lead a midfield unit along with Jackson Murphy, Cullin Anastasia and Sean Lanzillo. Oliver Ames has had a target on its back for the last couple of years as they claimed four of the last five Davenport titles but after winning the program’s first ever Division 2 State Title last Fall, it’s bigger than ever. The Tigers will have to replace two All-State players in Chris Romero and Keegan Nutt, as well as three seniors from their league-best defense last season. However, OA does return a good chunk of starters as well as experienced bench players from the state championship team. Senior Thomas McCormick has been causing havoc for defenses for two years and will be relied upon to do so again this year. 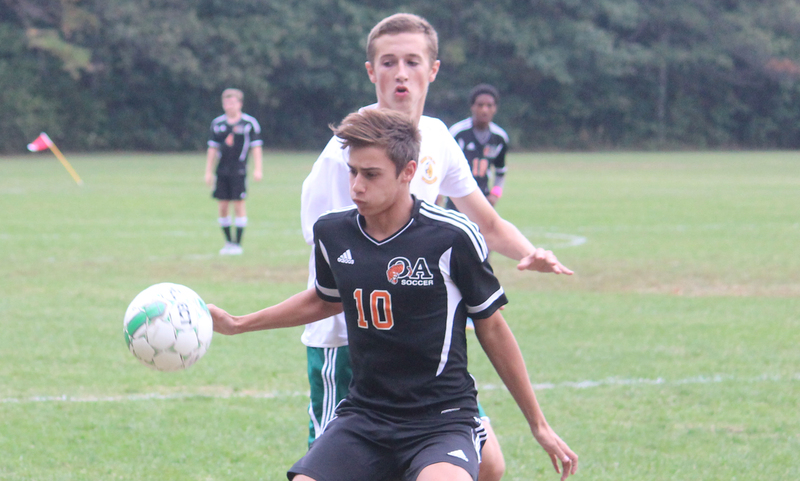 Nathaniel Cardoza, the 2015 HockomockSports.com Underclassman of the Year, will be back to control the middle of the pitch alongside Cam Vella, who showed his ability to get forward last season. Juniors Matt Campbell, Matt Alvarado, Jack Sheldon and Mason Galbato all saw time in the midfield last season and look to be contributors this year. Junior Jack Carroll is back in net again this year. Barata noted that losing the back line, one that surrendered just 12 goals all season, will be a major challenge for the Tigers this season. With a new coach at the helm in Taylor Whitters, the Taunton Tigers are looking to build a new foundation for years to come. Whitters, who was previously the boys freshmen coach, is hoping the Tigers can rise up to the challenge of the very talented Kelley-Rex division. Two key returning players include sophomore Hasan Farahat and junior Daeshawn Duffie. 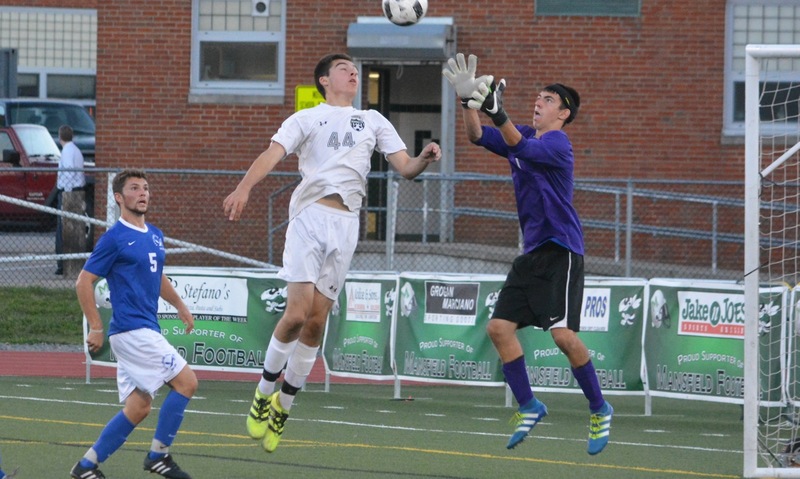 Both players possess strong soccer skills and will be vital parts for Taunton both ways as they patrol the midfield. Senior Sean Crowley will be tasked with pacing the scoring for the Tigers while freshman Colton Madeira, senior Dan DeAndreade and junior Jake DeAndrade will all be factors as Taunton pushes forward. Junior Liam Crowley will factor into Taunton’s defense and sophomore Liam Crowley will play a role in Taunton’s midfield. “We are going to rise up in our league with respect, integrity,encouragement, unity and pride,” Whitters said. MANSFIELD, Mass. – Mansfield junior Kevin Bouck picked a pretty good time to score his first goal of the season, giving the Hornets the lead with less than a minute to play in the first half. Senior Jake Staples picked an even better time for his. Staples got on the end of a long free kick from junior Max Gurnon, lunging in the area to get his head to the ball and find the back of the net to break a tie game with just over 10 minutes to play. The goal would hold up over the final minutes and Mansfield picked up a 2-1 win over King Philip in the Second Round of the D1 South tournament. After a delay for continuation, the referee whistled KP for a high kick just before midfield. Gurnon hit a line drive ball right over the top of the defense and Staples sprinted in right behind and headed the ball in for the game winner. It was a battle throughout the first half, and really throughout the entire game. King Philip sophomore Larsen Keys had the first chance of the game, taking a cross from junior Colby Koch but his shot went just wide at the far post. In the 14th minute, Tyler Mann ripped in a cross that was dropped by Mansfield goalie Michael Kirejczyk but he was able to get a touch to the loose ball and it was cleared away. Mansfield’s first chance came in the 19th minute as Jareme DiLirenzo muscled his way through KP’s defense and unleashed a shot from a tight angle but Brandon Ziolkowski was in position at the near post. The Hornets first tally came from seemingly nothing as Sean Lanzillo blocked a clearance and quickly fed Charlie Rogers in. Rogers raced to the end line and then centered a cross back where Bouck easily buried it into the back of the net with less than a minute to play in the first half. It didn’t take long for the Warriors to level the game in the second half, knotting the game at one less than four minutes in. Senior captain Joe Kellett came away with a steal at midfield, took a touch before sending Mann down the left flank. Mann did well with his hold up play, allowing Kellett to come on an overlapping run and he laid it off. Kellett took possession, raced towards the end line and hit a perfect low cross back across the middle and sophomore Mike Rowe slotted it into the corner of the net. 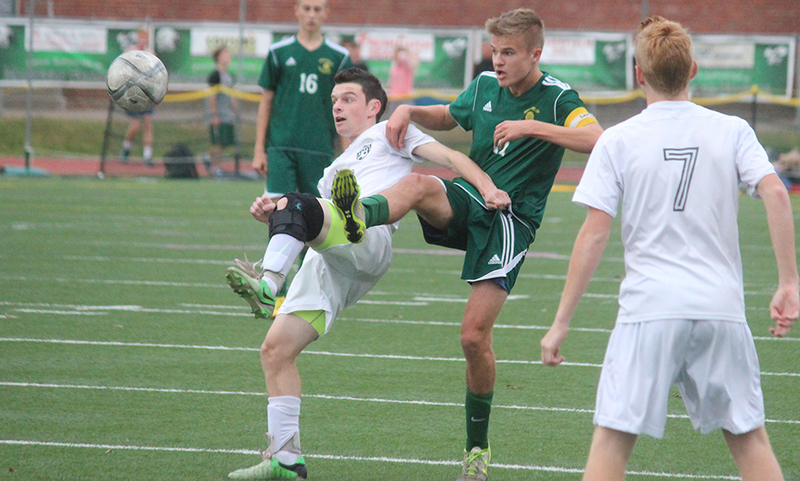 Midway through the second half, the Warriors thought they had earned a penalty kick. Mann took control in his own half and raced nearly 60 yards before being taken down from behind right on the edge of the area. The ref originally seemed to point to the spot for a PK but instead it was placed at the 20 yard line. Kellett’s ensuing free kick was unable to elude the wall and was cleared. Staples’ goal came with just over 10 minutes to play and neither side was able to register a scoring chance in the remaining time, despite five long throw in opportunities for KP. “A loss is always a sour taste in your mouth but when you have two good teams that battle it out, and that was one hell of a goal on that second one from Mansfield, it’s kind of hard to walk away and say you didn’t try to earn it,’ King Philip head coach Nick Gale said. “The kids left it all out there. It was a well deserved win on their part. Out of the three games we’ve played them, that was probably the best they’ve played. KP finishes the season 8-8-3 overall. Mansfield is now 13-3-3 and will advance to the Quarterfinals of the D1 South tournament and will travel to #4 Needham on Sunday. The time is still to be announced.